Civic Center Park was created more than 100 years ago as the civic heart for the city of Denver. 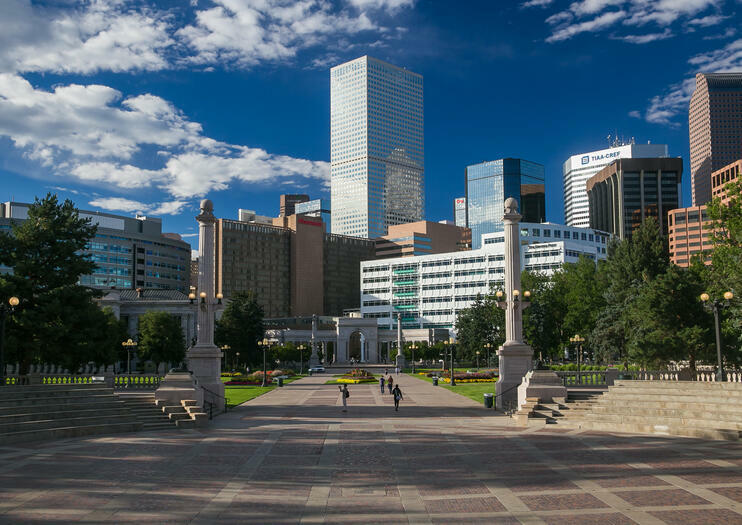 The urban green space is the site of the Colorado State Capitol, and arching footpaths across the park offer a chance to stroll among the gardens and marvel at the surrounding architecture, including the Denver City and County Building, the Denver Art Museum and the Denver Central Library. The park is also home to the Greek Theater and the historic Carnegie Library. Recent revitalization efforts have turned Civic Center Park into a hub for local events including outdoor movies and Civic Center EATS, an annual, summer-long tradition in which local, gourmet food trucks convene at the park every Tuesday and Thursday during lunchtime. Civic Center Park is located in the Golden Triangle Museum District of downtown Denver. It sits between Bannock Street and Broadway from west to east, and Colfax Avenue and 14th Avenue Parkway from north to south. The park is within easy reach of nearby attractions like the U.S. Mint, the Denver Art Museum and the 16th Street Mall, and it’s easy to explore the park and the surrounding attractions using public transit or the local bike-sharing program.